If you don't know how to shorten or lengthen the solid bracelet, please contact your SINN dealer or the watchmakers in our customer service department in Frankfurt am Main. Our customer service employees are also happy to help you over the telephone. Determine the relative lengths of the two sides before adjusting the length of the bracelet. To ensure maximum comfort, both sides of the bracelet should contain the same number of links. If this is not possible, the top bracelet strap (above the 12 on the clock) should be longer. 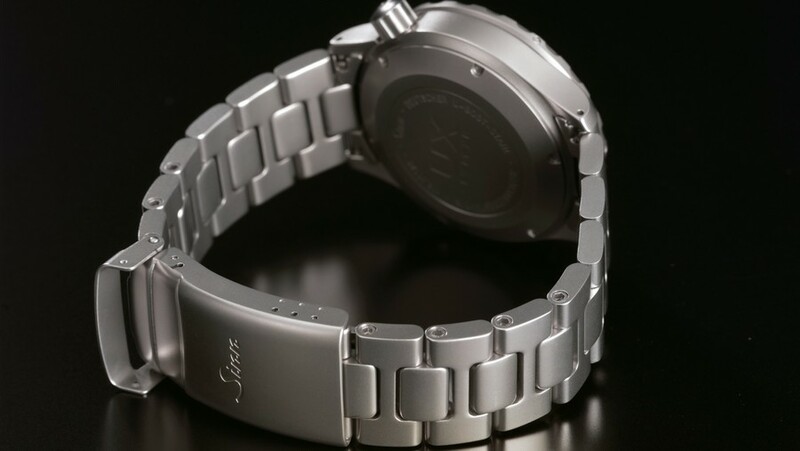 It is not necessary to detach the solid bracelet from the watch or the clasp. 1. Loosen the screws on the side of the bracelet link which is to be removed or added. 2. Remove the superfluous bracelet link or insert a new one. 3. Before screwing tight, add a small drop (no more!) of thread-locker (AN 302-42 medium-tight) to the thread of the bracelet screw. 1. Release the silicone band from the clasp. To do so, use the pointed end of the band replacement tool to push the spring bar out of the fastener. The other side of the spring bar can be removed while the fastener is open, enabling you to remove the silicone band. 2. Using a knife or scissors, cut the silicone band in the middle between two metal pins. You should shorten the band symmetrically and little by little, starting from the clasp, until you have reached the desired length. Test the length from time to time before proceeding. Shortening both ends by the length of one metal pin results in a total difference of 10 mm in the length of the strap; shortening one end reduces the length by 5 mm. 3. Remove the first metal pin and replace it with the spring bar. Then reattach the clasp to the band. We recommend first inserting the bar at the red marker, as per the illustration. If the silicone strap is too tight, use the option shown in the illustration by the white marker.